For every report that has no merit, thousands of calls go unmade because someone is afraid to make a report, afraid they aren’t educated enough to know neglect when they see it, and that is the point of this blog: To Empower you with Knowledge. We do not want people reported who are giving suitable care, and while it doesn’t happen often, we would like to help the well meaning animal lover better understand what is and isn’t neglect in the Horse. First, never speak to the person on your own UNLESS you have a personal connection to the owner and know they are rational, sane people. Do not step on property you do not own. These things just aren’t safe. Both are mentioned over and over in posts when someone says, “If they had just come and asked, I could have explained.” That sounds great, and in another time period, maybe this would have been ok, but trust me when I say this isn’t a good idea because if the folks really are abusing or neglecting their horses, sometimes drugs and other illegal activity are involved, and it simply can be very dangerous. Horses are not legally required to have shelter in most states. That is not a cause to make a neglect call. Horses create mud. Mud alone is not a reason to report poor care. Horses in the rain are not a reason to call into animal control. Horses in snow are not, either, even without blankets. Not being able to see hay or water if you cannot access the entire fenced area or barn area is not a reason to call in a complaint. A horse laying in the pasture is usually not starving or dead, he is napping. Horses do that. Not seeing someone out with the horses is not a reason to call in a complaint. A swayed back at a good weight like you see here is NOT a reason to make a report. Learn what a healthy weight and healthy environment is for a horse, and learn the physical signs of health. This will help you, through a multi faceted approach, know when you make a call about neglect. Here is Alice. She was a body score of 1.5 out of 9 on Henneke Scale. This type of neglect is obvious. The entire fenced area is seen from the road. Hay, grain and water is not present. The horses are seen eating corn cobs from the mud. They have poor coat condition and are covered in bite marks and untreated open wounds. There is trash and metal through out the pasture. Both horses are skeletal, with ribs, spine and hip bones being obvious. This is an easy call to make to request animal control or the sheriff look into this case on behalf of these horses. There are no humane reasons why horses should be in this condition. This is extreme neglect. If you look at the scene above, what do you notice? From a distance, it may seem ok. You see round bellies, and you see hay, but this is a scene of tremendous neglect. The black horse on the left has died, You can see the bone structure clear enough to see the horse was emaciated. The Palomino on the far right is heavily bred, thus the large belly, but the hip bones and top line indicate poor nutrition. The grey laying down has a protruding spine, but it is hard to see from a distance. The other two horses are at decent weight, and typically you see this type of mixed scenario when some horses have been at a location longer than others or when the dominant horses are able to get whatever bit of food is offered or in the horses that have better teeth. The hay fed is molded, exposed to the elements and has little nutritional value. Color and texture and smell (if you’re close) lets us know this. This is a scene of neglect. There are no reasons beyond neglect for the scene we see here. This scene shows two horses at body scores of 2.5 and 3. These horses are shown in a backyard without sufficient access to forage to sustain themselves. This is a more difficult situation. The coats do not look bad. You see horses with faint hip bones, spine and ribs showing. At this time it is reasonable to wait to see if the horses improve over a few weeks time if you know you will be driving by the area again. While the space you see may be too small, size of the area isn’t a factor for neglect, in general. So While the weight on these horses is not adequate, in this situation, we would recommend you watch closely to determine if the horses make improvements. If a horse stays at this weight as weeks pass without any sign of gaining, it is time to make a call to Animal Control. In the case above, by the time we got these horses, their conditions had deteriorated because no one had made a report. The story was, when they were surrendered, they have put weight on them since these photos were taken, but they had not done so at all. You see a mare in this condition with a foal on her side. You might remember people saying mares often look like this after foaling, but that is not true in a mare who is fed properly. This is a very urgent situation. 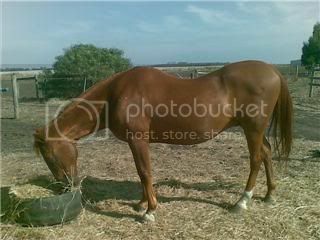 This mare is a body sore of 2 (the belly is still distended from having a foal recently but doesn’t relate to weight). She is trying to produce a lot of milk daily for her foal, and the foal is growing at a rapid amount. A mare who is healthy and cared for will never look anything like this with a foal on her side. A mare can be kept in lovely condition with proper amounts of food when lactating. This scene above is neglect. This horse (a previous rescue, Reese, midway through rehab) is a body score of 4. You can barely see some ribs, You can just barely see the spine outline, as well as the croup. The horse has a lovely sheen. His feet are trimmed. His eyes are bright, and he is animated. This is not a case that requires a call. Consider all areas I’ve mentioned. Coat condition, hooves, eyes, animation and condition. This horse does still need a bit of weight, but all factors point to a horse in good health and likely making progress toward a suitable weight. For this horse, he should be a body score of 5. Some horses, like very active and fit Thoroughbreds and Saddlebreds will be body scores of 4 and be perfect. Ponies and Drafts should be body scores of 6, as a rule. There is some minor variation, but coat condition, bright eyes and trimmed hooves tell the rest of the story if you’re in doubt. This mare is a body score of approximately 2. This is not an acceptable weight. This is the a point where you will find people say, “The horse looks fine,” unfortunately. This is not fine. This is not acceptable in a senior horse, a mare with a foal or a young horse – Not in any horse. You can see the points of the hips, all of the ribs, coat condition is dull and the croup and spine are easy to see. If a horse is a body score of 2, meeting all this criteria, chances are the horse is either neglected, at a rescue or recently arrived to a private individual’s home as a rescue horse. If the horse is at a rescue or a qualified private farm rehabbing the animal, they will have records of vetting, farrier work and be able to show an officer who would follow up on such a report their feed and hay access, as well. Hooves: A horse may be a perfectly good weight or over weight and still neglected. Feet that are untrimmed, founder or other issues related to the body of the horse, beyond weight, add up to over all quality of care. In West Virginia, lack of farrier access if needed is a crime. These equines above show extremely neglected hooves. Making a call to request a an officer look further into a situation would be warranted, regardless of weight or other conditions. Did you know that extreme obesity is also a type of neglect in the horse? This pony was extremely foundered due to no concern about her diet over her short life.This is a body score of 9. In horses or ponies, metabolic issues can arise that require medication. Grazing muzzles and limited grass can be required for very easy keepers. If a horse limps, lays down a lot and stands in this position, and you see this is an on going problem that isn’t being address, that is also neglect and warrants investigation by animal control. A weak top line in the very aged horse is not a reason to make a complaint. This is an image of a gelding who was the world’s oldest horse at over 50. As a horse ages, some lose muscle support along the back, and some develop cushings (causing long hair over the body that may be shaved for comfort). The senior horse presents a different picture than the young horse when we consider what to look for in neglect cases, but senior does not mean thin. It means different care is required and the body composition can be a bit different. A senior horse should not be emaciated simply due to age. Finally, breeds, conformation and fitness have an effect on how an equine body looks. The scoring remains the same, though. You have to look at the spine, tail head, neck, hip bones, croup and ribs in regards to how flesh covers them. For instance, here is a Thoroughbred who is very lean, healthy and fit. This is a body score of 3.5 – 4. There is a nice article that explains condition and breed / body type at this link. A Draft horse, Miniature and ponies would look poor at a body condition of 3.5, however. Every single horse below had someone who said they were providing enough care, and every single horse below had an owner who wasn’t being honest. Finally, remember it is not up to you, as the concerned citizen, to make the case for neglect or abuse. It is up to you be informed enough to not make a report that is clearly unfounded. If care is suitable, if there are documented medical reasons receiving treatment causing the poor condition or if there are other circumstances relating to the condition of the animal, animal control or law enforcement will establish this upon further view, but if we remain silent once we know signs of poor care, we are as guilty as those neglecting. In our experience, every single horrible neglect case we’ve been involved in had someone who cared enough to make a report, an animal control officer who came in and established poor care and an owner who always had a list of reasons why the care was suitable. Isn’t it better to err on the side of caution if you’re not sure and ask for them to be checked out? We believe it is best to first try to educate one’s self to learn the basics of good care, but if after one does this, they aren’t sure, then yes. It is best to err on the side of caution.